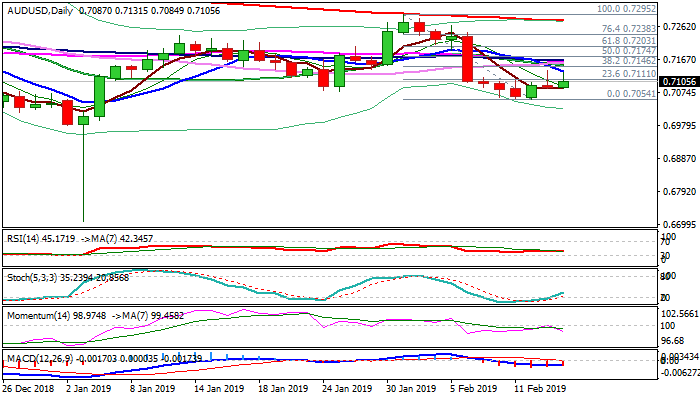 The Aussie dollar ran out of steam again at 0.7130 zone in late Asian trading on Thursday, following strong upside rejection on Wednesday and dipped back to 0.7100 zone. Support from better than expected China's data and positive rhetoric about US/China trade talks, was so far short-lived, keeping recovery from 0.7054 base limited. Negative momentum and MA's in bearish setup on daily chart weigh, with north-heading stochastic partially offsetting negative signals. The pair struggles on approach to pivotal Fibo barrier at 0.7146 (38.2% of 0.7295/0.7054), with the downside expected to remain vulnerable while recovery is limited. Daily cloud's twist next week would also attract bears for retest of 0.7054 base and extension of pullback from 0.7295 on break. Initial bullish signal could be expected on sustained break above 0.7146 pivot, but fresh bulls would face another strong barriers, provided by a cluster of daily MA's at 0.7151/64 zone and only firm break higher would confirm reversal.